Welcome to the brand-new resource website for Inspired. Check out the huge range of free resources, browse further information about the course or download sample units to try with your students. Inspired is an exciting four-level American English course written specially for teens. This unique series evolves with students, and reflects their changing needs and interests. Cross-curricular topics and cultural content inspire students to develop critical thinking and express their own opinions, whilst developing the key skills. Want an online practice environment for students using Inspired? Accessible anywhere with an internet connection, extra practice has never been easier, more flexible or more affordable. Check it out! 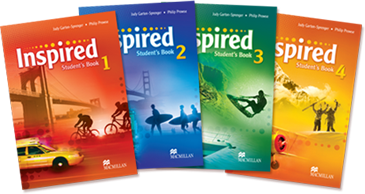 Inspired has been written by Philip Prowse and Judy Garton-Sprenger, both of whom have a wealth of English language teaching experience and knowledge. Today Macmillan Education publishes English Language Teaching (ELT), school curriculum, Spanish curriculum, digital and online materials to suit the needs of classrooms around the world.